Supertraker is the UK’s established manufacturer of wheel alignment equipmentSince the 1980’s Supertracker have worked along side car and tyre manufactures to bring advanced wheel alignment equipment and training to the local alignment experts, as well as the main dealer garages. This has helped to guarantee that your local Supertracker user is an expert on the most technical subject in the motor trade. There is a very finely balanced suspension system between you and the road, which can be fully adjusted with precision equipment and advanced on going training. As vehicles evolve we evolve parallel to them in order to keep it that way. Setting the vehicle’s suspension and steering geometry gives you the correct handling of the vehicle and optimum tyre wear. As a rule, this should be done every 10,000 miles or at least once a year. Depending on how the vehicle is driven. Why is my steering wheel off centre? This is due to the front or rear toe being unsymmetrical and in need of adjustment. My car is pulling to the left or right ? This can be down to the tyres or unequal caster settings. Does having worn tyres mean that the car can be aligned or do new tyres need to be fitted ? New or old tyre fitted will make no difference to the alignment readings. They will however have an effect on the way the car feels, even after the alignment has been corrected. Why do prices vary so much ? This depends on the make and how many adjustment there are on the vehicle. 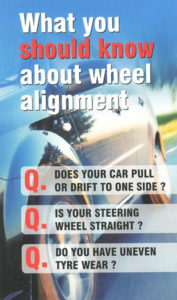 Why four wheel alignment ? Tyre wear is a problem if improper alignment has been carried out or mechanical replacement has occurred. A properly aligned vehicle can add thousands of miles to your cars tyre life. The majority of tyres are replaced due to wear and tear. Fuel mileage increases as rolling resistance decreases. With all four wheels aligned to the correct specification you will have the best possible rolling resistance on your vehicle. This will give you the best possibility to reduce fuel consumption. If your car pulls left or right, drifts to one side, feels non- responsive in corners, wanders or tramlines when driving on a straight road, these are all symptoms of mis-alignment. This can be corrected and make the vehicle handle properly, making it safer to drive. In the alignment process all steering and suspension joints are inspected. Any worn parts can be identified. Parts can be replaced earlier helping to eliminate potential break downs or component failures. Camber : What is it? Camber increases or decreases the tyres grip on the road by the wheel not being upright, when viewed from the front or rear. Correct camber is a requirement ana incorrectly set at best will cause tyre wear but at worse could seriously compromise the overall handling characteristics of the car. Caster: What is it ? Toe: What is it ? Positive Toe is the leading edge of the wheels closer together. Negative Toe is the leading edge of the wheels further apart. Our advice would be not to refer to toe as toe-in. For example negative toe is toe out! Better to simply say the car has negative toe or positive toe’. The rear wheels on many modern vehicles are just as adjustable as the front. Suspension misalignment increases tyre wear and can seriously affect vehicle handling. Suspension misalignment costs you money, as well as affecting the way your car handles!